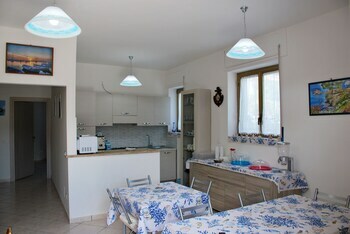 Located in Agropoli, La Via del Mare is a 2-minute drive from Bay of Trentova and 6 minutes from Port of Agropoli. Free self parking is available onsite. When you stay at B&B Xenia in Agrigento, you'll be near the beach and 5 minutes by foot from San Leone Beach. Featured amenities include dry cleaning/laundry services and luggage storage. When you stay at La Lanterna in Chiesa in Valmalenco, you'll be near ski lifts and steps from Malenco Valley. Featured amenities include luggage storage and a safe deposit box at the front desk. When you stay at Villa delle Ciliegie in Loreto, you'll be near the beach and 7 minutes by car from Basilica di Loreto. Free self parking is available onsite. With a stay at this vacation home in Castrignano del Capo, you'll be near the beach, just a 3-minute walk from Santa Maria di Leuca Beach and 8 minutes by foot from Marina di Leuca Port. Located in Venice (Dorsoduro), this apartment is within a 10-minute walk of Ca' Rezzonico and Academy Gallery.